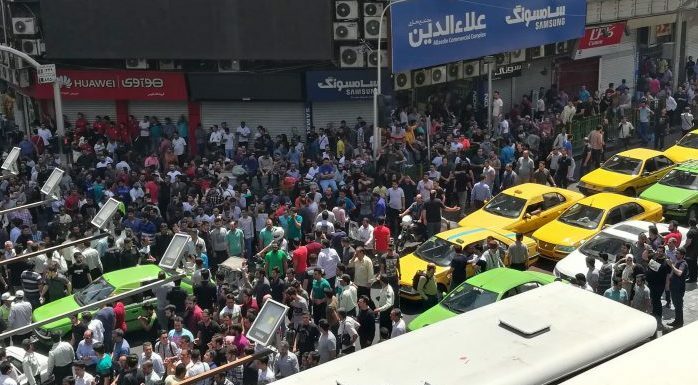 Iranian protesters gather at Mobile market in Tehran on June 25, 2018. In it, Shakespeare’s tragic villain, the ugly hunchback Richard schemes to depose his brother from the throne of England and steal it for himself after slaying the child heirs—his nephews. He eventually meets his fate, dying at the Battle of Bosworth Field. In many ways, Shakespeare’s classic mirrors the ascension of the mullahs in Tehran who stole the revolution in 1979 that deposed the Shah of Iran only to turn it into a tyrannical Islamic theocracy that has regularly imprisoned, abused, tortured and hanged its own people including men, women and children. It is only fitting today we may be witnessing the third and final act for the Iranian regime as it is rocked with an ever-increasing tempo of mass protests that have swamped the country and put the mullahs and military allies in the Revolutionary Guard Corps on the defensive. The popular protests started spontaneously last winter and were rooted in economic woes being experienced by ordinary Iranians, including much of the poor in the more remote provinces outside of Tehran including farmers, coal miners, and other workers. Unlike the protests in the wake of the disputed presidential elections of 2009 which were largely centered in Tehran and were powered by middle class and educated Iranians, these protests have swollen to include broad cross-sections of Iranian society. The most recent protests have engulfed the Grand Bazaar in Tehran and reflect the despair and frustration of Iranian business owners and merchants over the virtual free fall in the Rial against the dollar, which hit an all-time low of 90,000 Rial for a single U.S. dollar. The financial fallout is so bad, the mullahs have sought to halt trading in dollars and banned the import of 1,300 foreign goods such as household appliances and consumer technology products. Additionally, the decision by the Trump administration to not re-certify the Iran nuclear deal and effectively end it brought on the reinstatement of economic sanctions that has crippled the Iranian economy that feeds its military adventures in Syria and Yemen. The Trump administration’s focus on stiffening those sanctions have resulted in a cascade of business deals being canceled culminating in a warning from the U.S. State Department that companies currently buying Iranian crude oil must completely cut those exports by November this year or face sanctions. The administration does not expect to grant any waivers to companies that purchase Iranian oil or invest in its energy industry, a State Department official said, putting these companies in a precarious position should they choose to continue doing business with the Iranian regime. Things have gotten so bad that a senior Revolutionary Guard Corps commander went on television to tell all Iranians they were duty-bound to help the regime overcome its economic problems. “It is our duty to work in coordination and synergy to help the government and other branches overcome economic woes and foil enemy plots for an economic war and psychological warfare,” said Gen. Yahya Rahim Safavi, a military adviser to top mullah Ali Khamenei. The regime sought to blame the economic woes on outside forces such as the U.S., even though protestors such as those taking over the Grand Bazaar, have increasingly and loudly denounced the regime’s foreign military ventures such as the Syrian civil war which has drained the Islamic state’s coffers dry. For Hassan Rouhani, the prospects look even bleaker as Khamenei weighs whether or not to sacrifice his puppet in order to satisfy calls for reform. For Rouhani’s part, he dutifully sent France, Germany and Britain letters with a list of demands calling it the price that needs to be paid in order for Iran to stay in the nuclear deal in a Hail Mary effort to keep an economic lifeline open. While the contents were not made public, we can easily assume Rouhani was demanding these countries keep their commitments for EU companies to continue fulfilling business deals, as well as continue buying Iranian oil. Without these lifelines, the collapse of the regime could be counted in months. One example of those collapsing deals was the decision by French-Italian regional aircraft manufacturer ATR to halt delivery of its turboprop passenger aircraft Iran ordered in the wake of the nuclear deal. IranAir, the regime’s national flag carrier, contracted to buy 20 planes from ATR and eight have been delivered with the remaining dozen now in limbo. Large commercial manufacturers Boeing and Airbus also announced halts in delivering airliners ordered by the regime which has used its commercial air fleet, such as Mahan Air, to ferry troops, ammunition and weapons to Syria to help support the Assad regime during its bloody civil war. Things have gotten so desperate for the regime that government spokesman, Mohammad Baqer Nobakht, called on diaspora Iranians to “bring their money to Iran” and urged all Iranians to invest their cash and gold into the economy. Of course, he neglected to mention the practice of arrested and imprisoning dual-national Iranians coming back to visit relatives which increased dramatically following the nuclear deal. The International Monetary Fund reported that a record amount of capital, $27 billion, was taken out of the country last year. Khamenei, in a sermon recently celebrating the end of Ramadan, called upon Iranians to stop taking leisure trips abroad, to make sure no more foreign exchange leaves Iran, according to the New York Times. In comments following on his boss’, Rouhani promised his government would cut spending, reduce international travel and fly economy class to ease the burden on the public. He also said his government would import raw materials at affordable prices to help domestic manufacturers and ensure supply for Iranians. Additionally, he urged ministries to issue government bonds to give people alternatives to the dollar and the euro for investing their assets. “If anyone thinks the government will resign or step aside, or go, they are mistaken,” Rouhani said. The clock is ticking on the Iranian regime and the mullahs.